You are here: Home / Blog / What’s The Best Punch Bag For Boxing? The Best Punch Bag for Boxing? I may well be biased when talking about this style of punch bag, because since the age of 11 I have spent thousands and thousands of hours training with it. There certainly wasn’t the vast choice that there is today (this was the best punch bag for boxing at the time) and as the old saying goes “If it ain’t broke don’t try and fix it”. That’s not to say I dislike any of the new punch bags coming onto the market, but I come from a humble background and if I can achieve just as good results from a well priced product I don’t see the need to spend hundreds of pounds on another. You can do every punch in the book on this bag (slightly dodgy with uppercuts, but I will come back to that later). You can move in and around the punch bag and the slight swing can give an “aliveness” to your training. “Leather? Vinyl? Canvas?” I hear you cry – For me, I always swear by leather, it seems to have more longevity – but, you have to remember, I was training 3 or 4 times a day on my punch bag! So, with my boxing training schedule in mind, I have asked other boxers and my clients for their opinions and many of them have great things to say of both the vinyl and canvas style. My advice would be – buy a punch bag to suit your budget and if you can stretch to leather… then do so. Uppercuts on a straight bag? – some people like to whack their uppercuts into the bag and feel the contact, but I encourage my clients to miss the bag with this shot. The uppercut should be a straight up punch and I believe training the follow through (by missing the bag) helps you understand the mechanics of the punch. I believe that this in turn helps you throw the uppercut properly when you have to use it for real in the boxing ring. When you hit the straight bag with an uppercut, you have to throw it in at an angle and then it stops becoming an uppercut. Don’t worry though, if you like to make contact with the bag when you uppercut, a couple of the bags coming up will accommodate this :-). Under the bag. Well if you’re spending a few quid you might as well get your money’s worth and the bonus about buying a 4 foot bag is going underneath it. Not only can you punch the 4 foot bag, you can lie underneath it and perform sit-up crunches & punches / or sit-up bag slaps – some of my clients favourite exercises (not) – but they are great for your ab’s! • Move around the bag 360 degrees. • Easy to move in and work in close with body punching. • Useful for multiple combinations up and down the bag. • You can go underneath it for sit-up punches and sit-up bag slaps. • Not that good if you like to make contact with the bag when performing uppercuts. • You need somewhere to hang it – you can buy stands, but these are generally unsteady and if you’re tall, they’re not high enough. A stand can also hinder your movement around the bag. This punch bag comes in a close second to the 4ft straight punch bag and I do use this punch bag throughout the Fight Yourself Fit punch bag workouts. You can get all the benefits of the standard 4ft straight punch bag, but you also have the uppercut ledge, to make contact, when you are using your uppercuts. In my opinion, the ledge is still angled too much, so you still can’t perform a proper straight up uppercut, but it is better than than the straight bag if you want to make contact with your uppercuts. If you’re looking to buy a bag of this style, there are a few things to look out for. Make sure the top part is not too wide because this in turn makes your left/right hooking too wide. Ensure that the lower part of the punch bag is wide enough to land good solid body punches. Sometimes the lower part can be quite thin, this not only hinders body punching but makes the bag top heavy and bounce about a bit when you’re punching. Like the 4ft straight punch bag the uppercut bag also allows you enough space underneath. So you can perform the sit-up punches and sit-up bag slaps. • Affordable – although slightly more expensive than the straight bag. • You can move around the bag 360 degrees. • Good for uppercuts, but still not great. • Sometimes the top part can be too wide,which is not great for head hooks. • Sometimes the lower part can be too thin, which is not great for body hooks. • You need somewhere to hang it – you can buy stands but these are generally unsteady and if you’re tall, they’re not high enough. A stand can also hinder your movement around the punch bag. 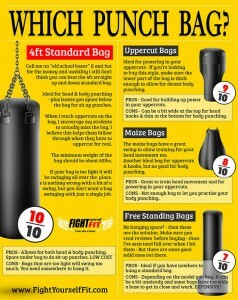 I love these bags, if you want a punch bag that really takes the impact of your uppercuts – this is the one. Having said that, what you gain in uppercut usability you lose in body punching, you can’t body punch with this bag. These bags are great fun to use though, they are smaller so have more swing in them. This swing means you can use them quite effectively slipping side to side and picking your shots. I love using the jab and sit-back, waiting for the bag to swing back towards me (imagining an opponent coming in) then whacking the bag with an uppercut, hook combination! So, not only do you lose the body punching with this bag, but you also lose the ability to do the sit-up punches. Still a great bag though. • You can use the movement of the bag to enhance your slip training. • Fantastic if you want to make impact with proper straight up uppercuts. • No lower part for body punching. • Too high to do your sit-up punching. • You need somewhere to hang it – you can buy stands but these are generally unsteady and if you’re tall, they’re not high enough. A stand can also hinder your movement around the bag. 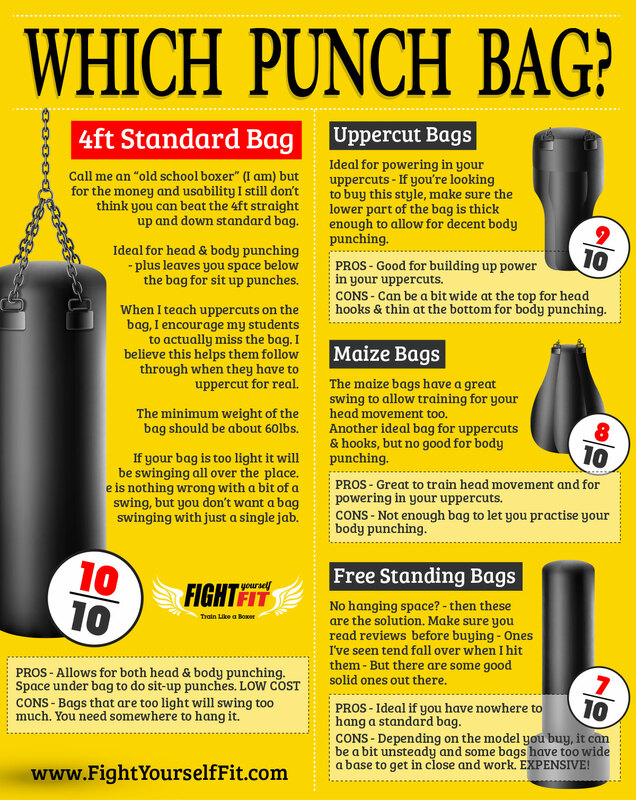 I am not a great fan of these punch bags compared to the other 3 options, so this doesn’t top my list for the best punch bag for boxing. But it does have a home on my list all the same, because if you have no hanging space or you have limited room, this might be your only option. You can perform all of the punches as per the straight bag. But, check out the width of the base before you buy as some bases are too wide to enable you to move in close. Also if you can, do “try before your buy”, as I’ve hit a few of these in my time and some of them can bounce about all over the place, I even managed to hit one over (not sure if it was set up correctly) – that being said, there are some good solid versions out there and it’s better that you have something to punch than nothing at all. Again, with this punch bag you do lose the ability to do the sit-up punches. • Ideal if you have a lack of space. • You can move in and work in close with body punching (base permitting). • These can have too wide a base to move in and hit. • These punchbags can be a bit bouncy. • Not that good if you like to make contact with your punch bag when performing uppercuts.